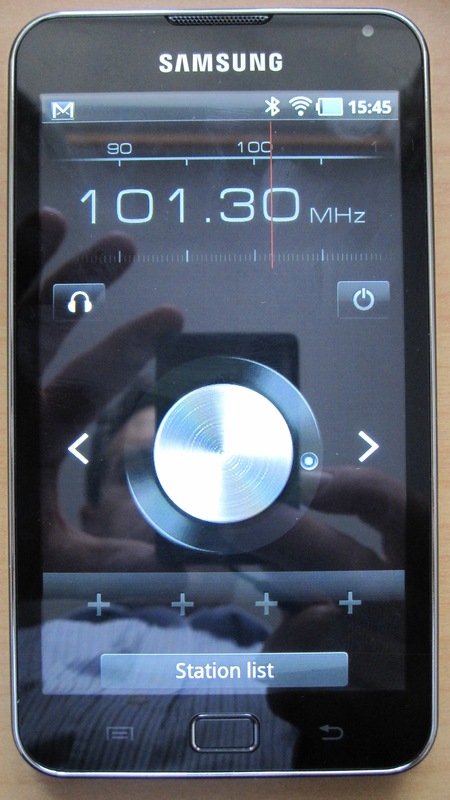 The following is my first review and impressions of the new Samsung Galaxy S media player. (Also known as the wifi 5.0 for some strange reason). The review will be updated soon with detailed battery life and usage details. There is a sister device with a 4 inch screen which is also now available. The overall build quality of the device is very good; I am comparing it to several phones and tablets I own. There are no cracks or give in the plastic body. (A slight movement in the middle of the rear case if you press hard.) Overall it feels solid in the hand. The screen is very good, nice deep blacks and strong but not over saturated colours. I guess if you like vibrant colour you need the Galaxy II phone. 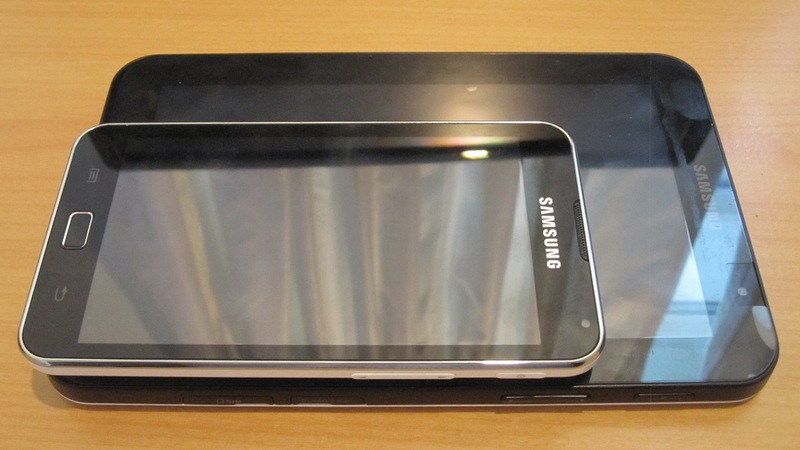 The screen is 5 inch diagonal in size and 800 x 480 pixels. No problem handling divx, or mpg4 video. Only needed to install a third party app (Rockplayer) to handle .mov files. The viewing experience on this size screen is excellent, beats any smaller pmp or phone screen hands down. For all of the audio comparisons in this review I’m using a pair of good quality Denon earphones, in a quiet environment, and I have pretty good hearing. So lets compare to the gold standard in pocket hi-fi the Cowon S9. Well the Galaxy S is quite good, with low background noise levels and clear audio reproduction. But to be honest it’s not in the same league as the Cowon. Maybe once I have time to tweak some equaliser settings it can be improved but out of the box it’s just good. However, it does have built in stereo speakers on the rear of the case. And while not hi-fi by any standard they are fine for watching a movie. A nice bonus compared to most Android phones, or pmp devices. Overall the Galaxy S gives a very nice user experience. The screen layout is clear and logical, uncluttered just like the bigger Galaxy Tab. Only Android 2.2 installed as yet, Gingerbread would be nice, and will hopefully appear this year. The speed of response in scrolling, and app load times is great, very smooth. The device has some 1Ghz CPU (couldn’t find which one.) and 381mb ram. This is the 16GB model, and I have a 32GB micro sd card fitted which is plenty of storage. 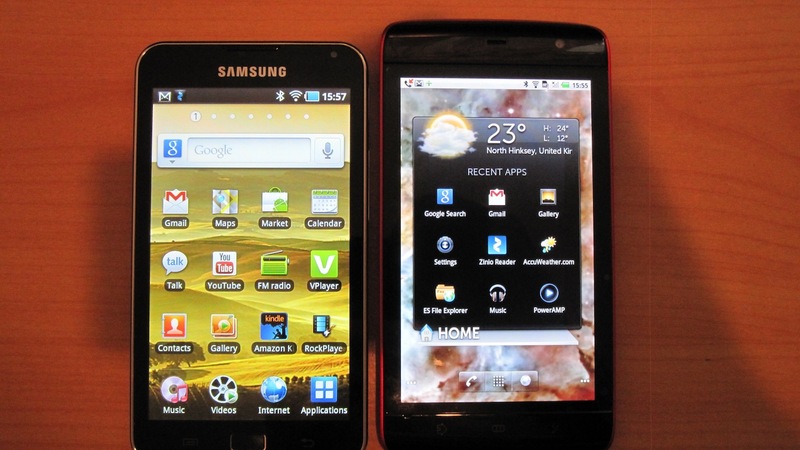 The best aspect of a 5 inch device is the way it sits in the hand, so much easier to operate than larger tablets. Of course the extra screen estate of the 7 inch Tab makes that better for ebook reading and a 10.1 inch Asus is ideal for browsing, but they don’t sit in my shirt pocket! 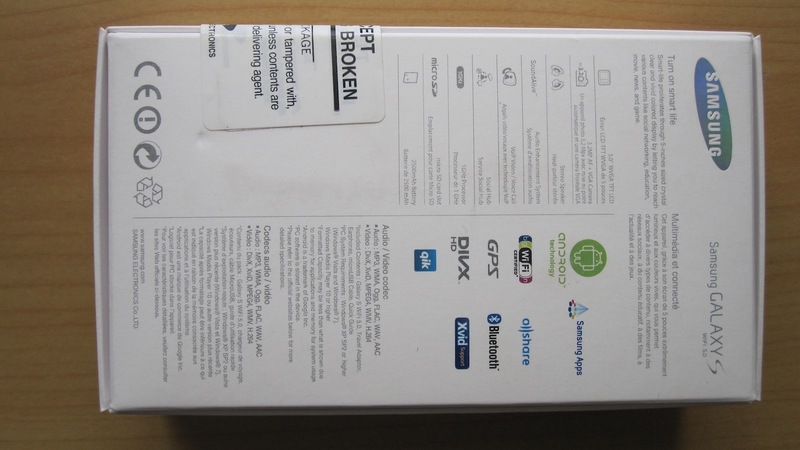 As stated the device has a micro sd slot, hidden behind a plastic cover on the top. It has a power button and volume rocker switch on the right side. And best of all a standard micro usb connector on the bottom for power charging and connection to a PC. (A power adapter and link cable are in the box.) This is great, I detest custom interfaces or charging ports on tablet or phone devices. Well done Samsung. Samsung give some nice apps for free via their own mini market built in to the device. Full Android market support is there as well. An excellent addition is the built in FM radio. For me this was a deciding factor in the purchase. Even better the radio interface is superb, see image below. And the reception was fantastic, after an auto scan it picked up every local station and the clarity is the best of any FM radio I have! Well not fully tested yet, will post a detailed analysis when I have time. Looks good so far, I can’t watch the battery bar fall as I use it, as you can on the Dell Streak. This is the closest competitor and I have both. The metal body of the Streak is nice and feels great, especially the red version. However the battery case on the Streak can just pop off, which necessitates keeping it in a case the whole time. The Galaxy S is plastic but it’s also 40gm lighter, and it feels lighter in the hand and pocket. The Dell is about 9mm longer, same width. The Galaxy S is about 2mm thicker. The screens are very close in overall quality, both are good. But the Galaxy has the edge with deeper blacks and faster response time. One problem with the Streak screen is nasty flex and colour bleed when pressed at the edge. This is annoying. Speed wise the Galaxy is faster, quite a bit smoother in general use and app loading times. But it is a year younger device, which of course is eons in computing evolution. Biggest issue on my Streak was the lack of Android market support, which makes app loading tedious. The built in apps and smooth Android market connection on the Galaxy is superior. Of course the Streak has built in 3G, but you pay for it in the upfront cost, (£400 vs £270 for the Galaxy). Well as you would expect similar excellent build quality. 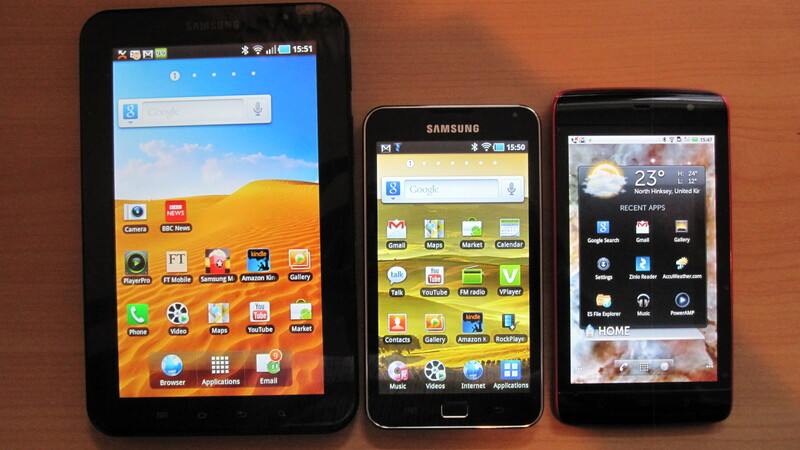 Interestingly the Galaxy S has better contrast and colour depth than the Galaxy Tab. Audio quality about the same. I will post later on which device I spend more time carrying and using. Probably not really meaningful to compare in specification as completely different classes of device. Same goes for the Asus. However, the Asus has Android 3.1 (well 3.2 from 29th July), and this is excellent. I look forward to this kind of Android experience on the Galaxy one day. The 5 inch form factor, I find ideal, easily slips in a jacket pocket. Nice and lightweight. Fast and smooth app loading and scrolling. Screen quality very good for an LCD. Built in media codec’s for most video. Rockplayer app handles .mov video so get that. White back case colour and chrome trim is a bit bling. But can live with it. No built in 3G, but this brings the price down and it is easy to wifi to a hotspot device. At the time of purchase only the 8gb and 16gb models were available, a 32gb model should appear soon. Very difficult to get hold of in the UK, had to order mine from www.pixmania.co.uk, who imported it from Belgium, so handbook is only in French! Buy one. Actually no buy two! My favourite Android device so far. If its gets a Gingerbread or later Android OS update it would truly rock. Overall Five Stars, for an excellent device. Some extra images below. The screen are a bit reflective! I´m from Germany, and it looks like the only source to get this device in europe (actually I want the 4.0 version) right now seems to be pixmania in France. So how was the deliviery, how long dit it take ? I can live with a french handbook (you can find PDF´s on the Samsung website), but what about the language on the device itself ? I guess the first boot is in french but you can change the language to english or german ? Did you encounter any other language issues ? Correct Pixmania is the only EU or UK supplier I could find. Delivery was fast 3 days. The website lists both the 5 inch and 4 inch as in stock. The device prompts for what language you want at first startup, so English option no problem. When you transfer files onto the device via the usb cable, at what speed do they transfer? Does the computer just see it as an external hard drive, or does it see the internal storage as one drive, and the sd card as a second? Can you play movie files that have AC3 audio? I haven’t seen that listed in any of the tech specs even though it’s a very well used format. Does the movie player have any kind of bookmarking feature so if you stopped watching a movie half way through, it knows where to continue next time? Can you delete files from within the movie player software, or do you have to do it from some other software/from the computer? How visible is the screen in brightly lit conditions? And is it easy to alter the brightness setting? Is it true that the player just shows one big alphabetical list of all the media files on the device, and just ignores the folder structure?